Honolulu Marathon women's champion Lyubov Denisova tested positive for elevated levels of testosterone earlier this month, costing her the chance of defending her Honolulu title. 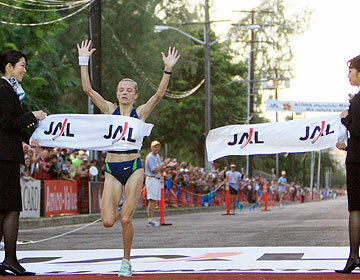 "I will never invite her to Honolulu," Honolulu Marathon President Jim Barahal said. Denisova won't hear her fate until later this month, when the Russian Federation hears her case. Andrey Baranov, her manager, says Denisova made an honest mistake of taking a banned supplement and will accept any punishment that is handed down. Denisova won Honolulu last year and will get to keep the $67,000 she earned at the race. But her manager says she was never running for the money, anyway. He says she paid her own way to practice with some Hawaii high school track teams in February. "Her career might be in jeopardy, but the only thing she talks about is that she might have let those kids down," Baranov said. 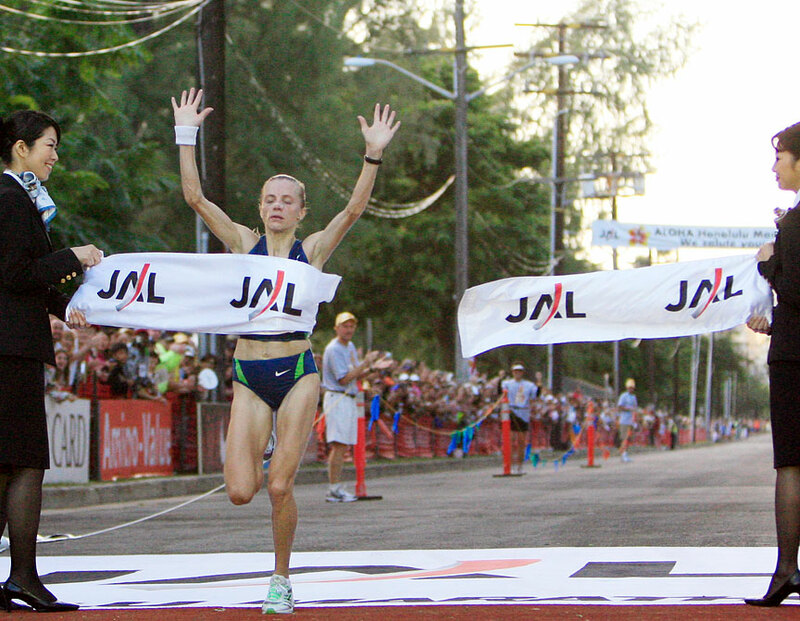 Lyubov Denisova surprised the running community when she set the women's record in winning the Honolulu Marathon as an uninvited runner last year. In May, she got a surprise of her own. Denisova, 35, tested positive for elevated levels of testosterone during an "out of competition" home visit by the World Anti Doping Agency on March 20. Both samples were tested and confirmed to be positive on May 2, according to her agent. "It was a huge surprise to everyone," Andrey Baranov, her manager, said. "She was 100 percent sure she was clean." Baranov says Denisova purchased a supplement on the Internet in January and began using it in February. He said she did not completely understand the English that described what she was buying, only that "it was cheaper on the Internet," and would have increased her oxygen capacity. The Russian champion thought it was legal but didn't ask anyone for a second opinion. Honolulu Marathon Association President Jim Barahal says Denisova's records will stand and she will keep the $67,000 she received in prize and incentive money. But he doesn't have to like it. "At this point I'd have to say that her performance would stand," Barahal said. "I can't imagine a methodology that would prove that she was contaminated when she ran our race. It would strain credibility to think she wasn't, but we have no way to prove it." The Honolulu Marathon has relied on USA Track and Field to handle drug testing for its event on a rotating basis, but hasn't had a runner tested since 2000. Barahal says that will change immediately. "Today a cheater was caught, and any time a cheater is caught that makes it a good day," Barahal said. "We will do drug testing in the future." Denisova will have to wait until the Russian Federation hears her case, but Baranov doesn't know when that will happen. He only says that his champion should not be judged until the Russian Federation has its say. But is Denisova a cheater? "No," Baranov said. "What is a cheater and what is not a cheater? She has been tested everywhere in her career and never tested positive before. She is a person who made a mistake." She finished seventh in the Boston Marathon on April 16. Baranov says she was tested after that race and came up clean and that he doesn't like his runner being labeled a cheater by an organization that didn't make an effort to test her. "All I can say to Honolulu is that you have to test," Baranov said. "You can't point your finger at someone and call her a cheater if you didn't test her. This has nothing to do with Dec. 10." Baranov hopes Denisova will set her sights on the 2012 Olympics even if she is banned. She won in Honolulu without being invited and Baranov believes she can accomplish similar goals if she sets her mind to them. "She went running today for herself," Baranov said. "Her life is running and she will keep running, even if it is not for money."